Striking ornamental grasses at the University of Washington Center for Urban Horticulture’s Soest Garden. Photo courtesy of UW Botanic Gardens. Landscape visionary James van Sweden, generally acknowledged to be the father of the “New American Garden,” changed the look and feel of many suburban landscapes by creating flowing, grass-filled gardens that are ecologically sound. With his recent death in September, gardeners are reminded of his designs, which often include sweeping masses of native grasses that sparkle in the light, move gracefully in the wind, and add color through the seasons, especially in late summer and autumn when they are in full bloom. 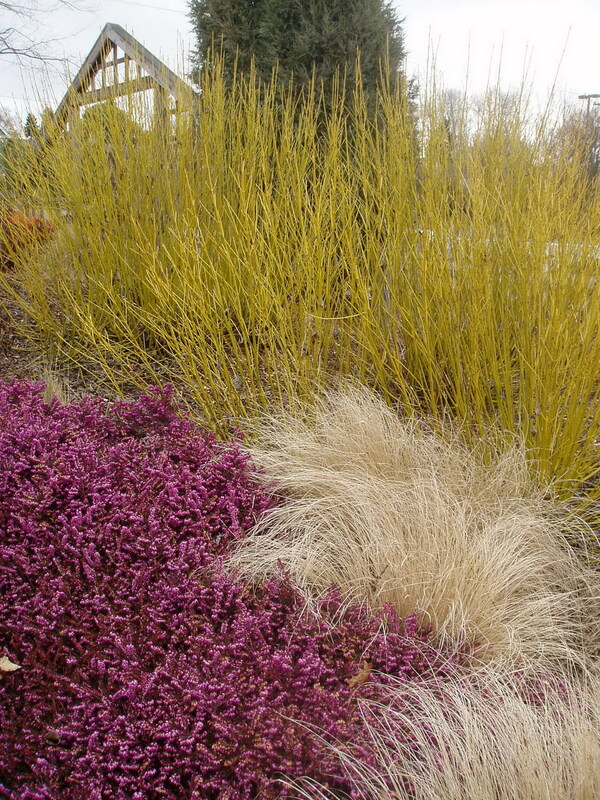 Two of my favorite native grasses that van Sweden and his design partner Wolfgang Oehme (pronounced UR-ma) used in their landscapes are Little Bluestem (Schizachyrium scoparium) and Purple Love Grass (Eragrostis spectabilis). Both are perennial sun-loving, prairie and meadow grasses that remain lovely in winter, even after it snows. Little Bluestem. Photo courtesy of University of Minnesota’s Minnesota Landscape Arboretum. 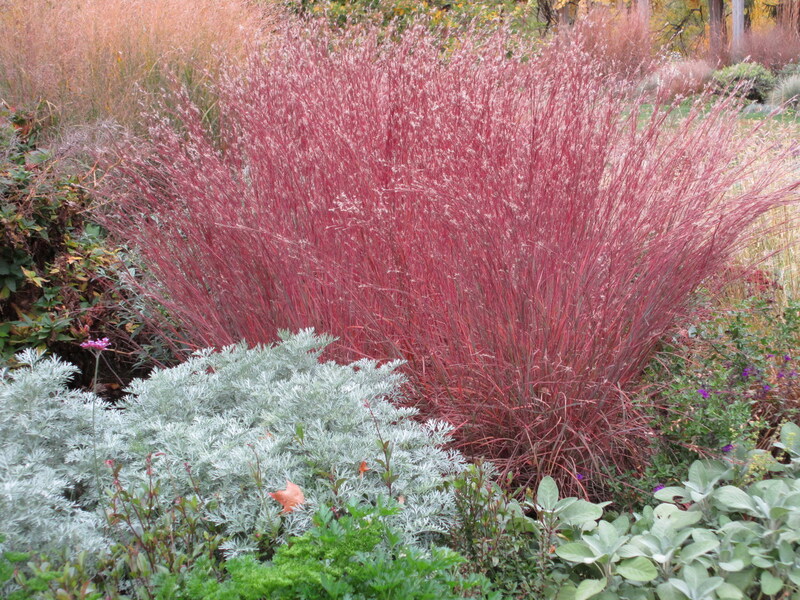 The fall foliage of Little Bluestem can range from copper, orange and yellow to deep purple and red. It grows in two to four feet clumps which can be cut back in the spring to let bulbs like daffodils emerge. In the summer, the grassy clumps can turn bright green to grayish-blue. The varieties that are bluer in summer have the deepest blazing red colors in the fall and winter. An outstanding feature of Little Bluestem is its silvery, translucent seed that beautifully captures sunlight. So consider planting this grass where the sun can backlight or sidelight the shimmering seeds. Another big plus: this grass is a valuable source of food and habitat for songbirds like the meadowlark, insects like Skipper butterflies, and even large animals like cattle and deer. The grassy clumps also provide shelter for birds and small mammals. You won’t need rich soil conditions for planting. Just provide a lot of sun, dry or average moisture, good drainage, or a sloping area (it is very good for erosion control on a hilly bed). It is also is very drought-tolerant and relatively salt-resistant in coastal gardens. Little Bluestem is native all across North America, although its presence on prairies has been reduced by commercial agriculture and overgrazing. 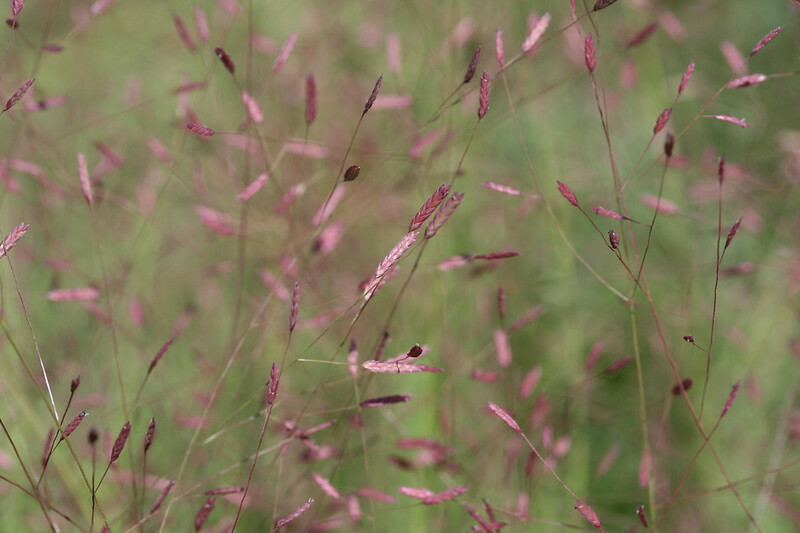 Somewhat less prevalent, but an equally beautiful alternative in the late summer and autumn, is Purple Love Grass, which forms floating, reddish-purple flower clusters that hover and can tumble away in the wind. The botanical Latin name Eragrostis spectabilis says it all—a direct translation from Eros, love, and agrostis, meaning grass. Purple Love Grass. Photo courtesy of the New England Wild Flower Society. Purple Love Grass, like Little Bluestem, loves sun and very dry growing conditions. But it forms shorter tufts just under two feet tall, taking on an amazing billowing texture in late summer. By October, it turns a warm brown color. A single small tuft can create a cloud-like bloom spanning a 3 to 4 foot area. With its purple flower heads, it looks gorgeous in drifts or sweeps along a border with pinkish sedums, or other late bloomers like purple coneflowers. Grass Talk, a blog run by University of Minnesota horticulture professor specializing in ornamental grasses, will satiate even the most obsessed grass lover. Joyce H. Newman, a Garden Variety contributing writer, covers gardening topics, green products and environmental issues. The former editor of Consumer Reports GreenerChoices.org, which evaluates environmental claims on green product labels, she holds a certificate in horticulture from the New York Botanical Garden. This entry was posted in Attract Bees, Attract Birds, Attract Butterflies, Fall Gardening, Garden Color, Uncategorized and tagged Eragrostis spectabilis, fall grasses, James, Joyce Newman, Little Bluestem, native grasses, ornamental grasses, Purple Love Grass, Schizachyrium scoparium, Van Sweden. Bookmark the permalink.